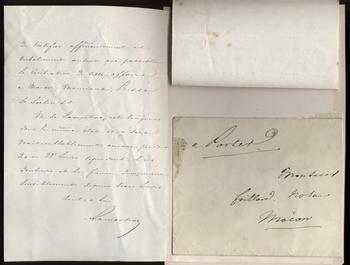 ALPHONSE DE LAMARTINE and MARIANNE DE LAMARTINE Autograph Letters Signed. French poet, writer, diplomat and one of the founders of the French Second Republic and his artist wife. Two ALsS. Paris. 29th June 1860 and 23rd May 1860. Both to a Monsieur Gaillard, a notaire. The text of both letters in French. 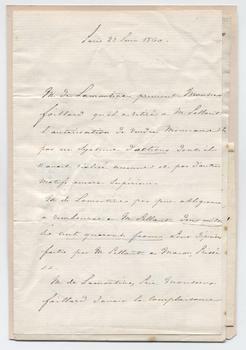 Alphonse De Lamartine's letter dated 29th June 1860 (2pp) says that he has removed M. Sellant's authority to sell due to combination of actions not taken and similar reasons. He has reimbursed him the sum of 2,640 francs (apparently a deposit by way of security) and he asks M. Gaillard to notify verbally as widely as possible in Macon and other places that the affair is ended. He concludes by saying that he remains in the same state of poor health and is likely to remain so for the next 20 or 25 days, although the pain and fever have reduced over the last three days. Marianne De Lamartine's letter dated 23rd May 1860 (1p) appears to relate to the same sale and says that her husband has been confined to bed with rheumatic fever and has lost the use of his hands and his eyes (?). It appears that there had been a suggestion that Lamartine had acted in a dishonourable fashion in relation to the sale (or purchase?) of some lands and she says that this is absurd and impossible. 8vos. Approx 8 x 5 inches. Madame De Lamartine's letter is tipped onto the integral blank leaf of her husband's, which is laid down by the blank leaf to part of an old album page, with an envelope addressed to Monsieur Gaillard, to be delivered by hand at Macon. The letter of Alphonse De Lamartine is fine and that of Marianne De Lamartine has a few marks and light foxing spots and is very good. Alphonse De Lamartine has been called the first of the French Romantic Poets and one of France's greatest orators. His poetical and literary work gave him a considerable reputation and he was also a successful diplomat. A social reformer and critic of Louis Philippe, his work, Histoire de les Girondins, incited the revolution of 1848 and when this broke out he was put in the position of de facto head of the provisional government. His perceived inactivity, however, led to his downfall and he was beaten in the election for the presidency by Louis Napoleon. Defeated and in considerable debt, he retired to Paris, where he ended his life in poverty and virtually forgotten. In 1860 he was forced into the sale of the family property and it is probable the sale of this property that is the subject of his letter to the notaire Monsieur Gaillard at Macon, the town of Lamartine's birth. 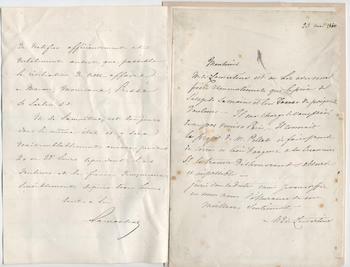 Autograph letters of Lamartine, particularly from this period, are uncommon. In 1820, Lamartine had married the English woman Mary Ann Birch (a relative of the Churchills), who subsequently took the more French name of Marianne. She brought to the marriage some independent wealth that enabled Lamartine to better pursue his literary and diplomatic careers but he had never really recovered from the early death of his first love, Julie Charles, and the marriage was generally regarded as one of convenience. Marianne De Lamartine was successful, in her own right, as an artist but, like her husband, was obliged to endure her final years in poverty and died in Paris in 1863.